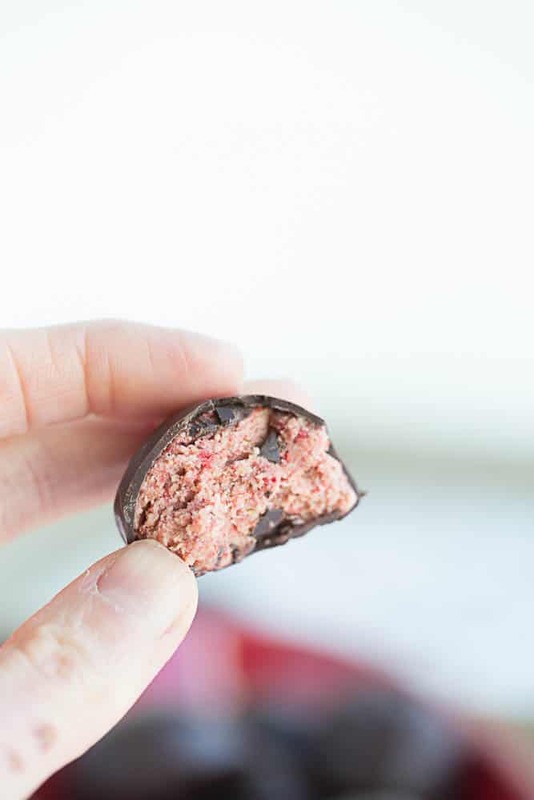 I’ve wanted to make these truffles ever since I posted the Strawberry Cream Nut Butter recipe last spring. Now I’m kicking myself for not doing it sooner because these are just as good as I had hoped they’d be! 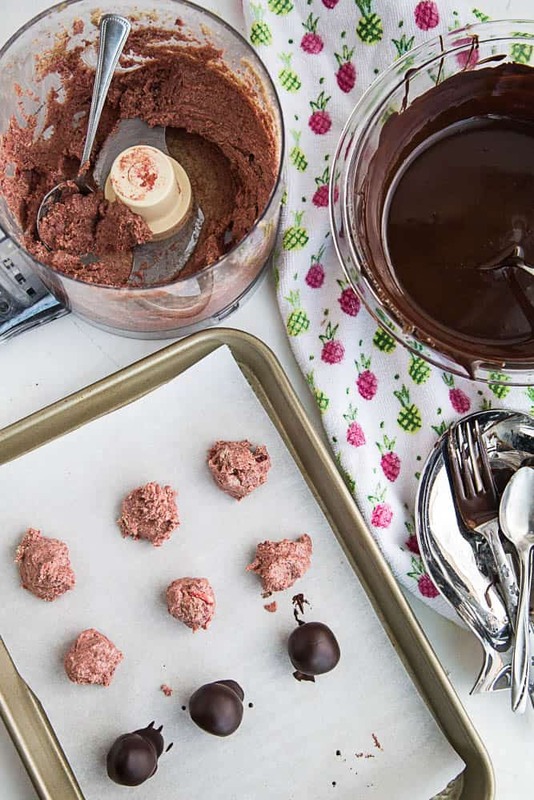 Once you have the nut butter made, just scoop out little balls and firm them up in the freezer so they don’t get mushy when you dip them in chocolate. Speaking of dipping things in chocolate…. I feel like that’s an area of cooking/baking where I’m not super confident. During the cake pop craze of 2009 I tried my hardest, but those poor cake pops were not the smooth, shiny treats that appeared in all of the recipes. Basically everything I dip looks like a toddler had his hands all over it. And there’s always one side that looks mangled from trying to put it back down on the parchment. These ones aren’t horrible, but I think nut butter truffles are somewhat easier to make smooth. At least on some sides. You can find freeze-dried fruit at a lot of grocery stores these days. I usually pick mine up at either Trader Joe’s or Target. I noticed my Safeway down the street had some, too. 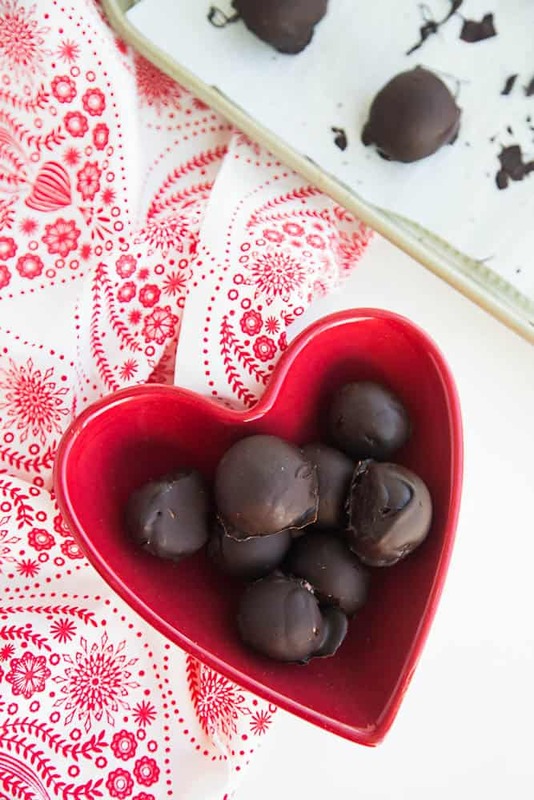 These are a great little treat to keep on hand during Valentine’s Day to share with someone who is vegan or trying to keep their sugar/carbs at bay. 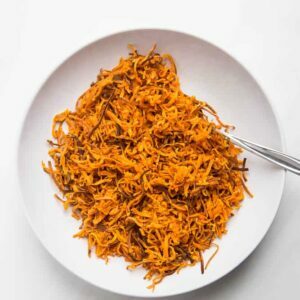 Or to keep for YOU if you happen to be coming off of a #JanuaryWhole30. And by you, I mean me. 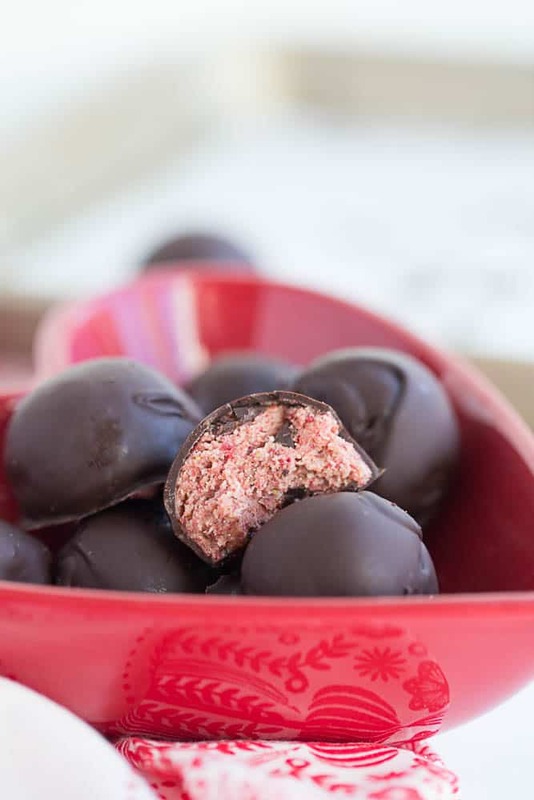 These naturally-sweetened nut butter truffles are flavored with freeze-dried strawberries and dipped in dark chocolate -- a perfect little healthy treat for Valentine's Day! Scoop spoonfuls of the nut butter and place them on the parchment -- about 1/2 tablespoon each. Put the nut butter balls in the freezer for about 30 minutes until firm. Meanwhile, find a heat-safe bowl that will nestle inside of a medium saucepan. Put about an inch of water in the saucepan and place the bowl on top. Turn the heat to medium-high. Add the chocolate and coconut oil to the bowl. As the water starts to simmer, reduce the heat to medium-low to keep it from boiling too rapidly. Stir the chocolate every so often until it is all melted and smooth. 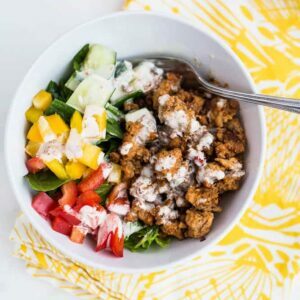 Remove the bowl from the saucepan and let it cool slightly. 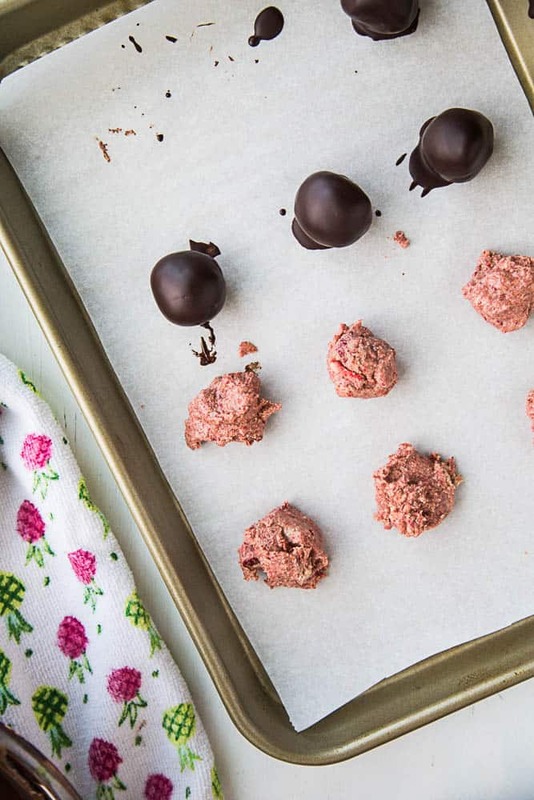 Remove the nut butter balls from the freezer. Take each one and roll it to form a smooth ball. Dip each in the melted chocolate, then life the ball out of the chocolate using a fork and hit the bottom of the fork on the side of the bowl several times to get rid of any excess chocolate. Transfer the truffle back to the parchment. 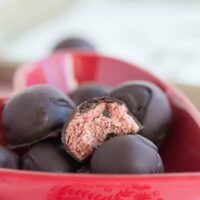 The chocolate on the truffles should firm up on their own, but if your kitchen is particularly warm, stick them in the fridge for a few minutes.